Everything we do at the Zooniverse relies on the wisdom of the crowd. That is the idea that a group of people asked to classify the same piece of data will arrive at a consensus answer which is correct. 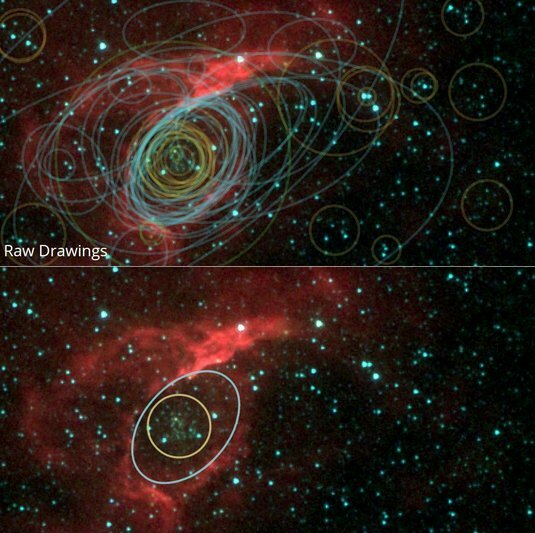 The above image shows this in action on the Milky Way Project. On the top we can see all the markings made by volunteers asked to identify bubbles and star clusters. On the bottom is the consensus of all these markings, clearly showing one bubble and one cluster. So don’t panic if you make a mistake. The crowd has your back! You can explore the raw drawings and consensus data for any Milky May Project image at explore.milkywayproject.org, a fantastic site created by Rob Simpson.